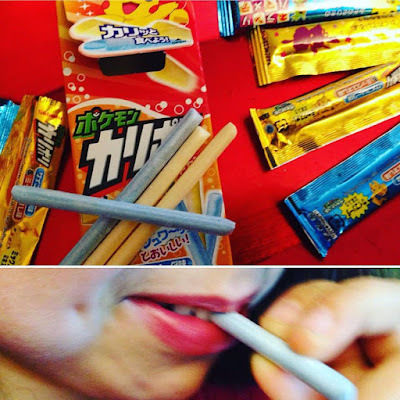 Revisando mi Japanese Candy Caja Mensual de Aperitivos Japoneses TokyoTreat. Os cuento que esta caja es la Premium de Enero de 2.017, que contiene 6 productos de la caja pequeña más un bonus, así como 4 productos de la Medium con un DYI, y 6 que harían la premium con uno especial, que sería la mascarilla. 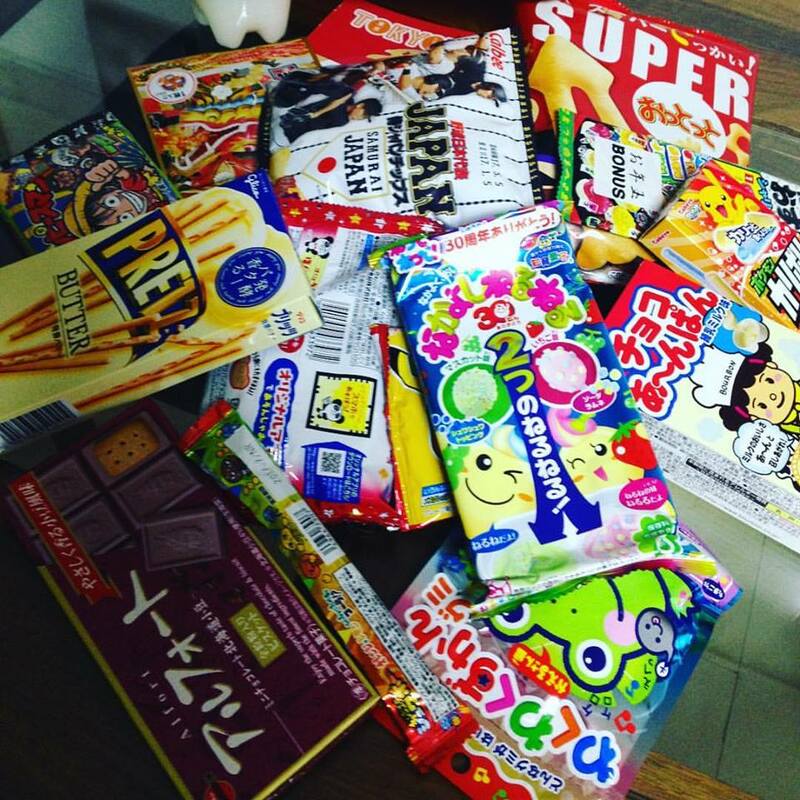 Checking out my Japanese Candy TokyoTreat Japanese Snacks Monthly Box. 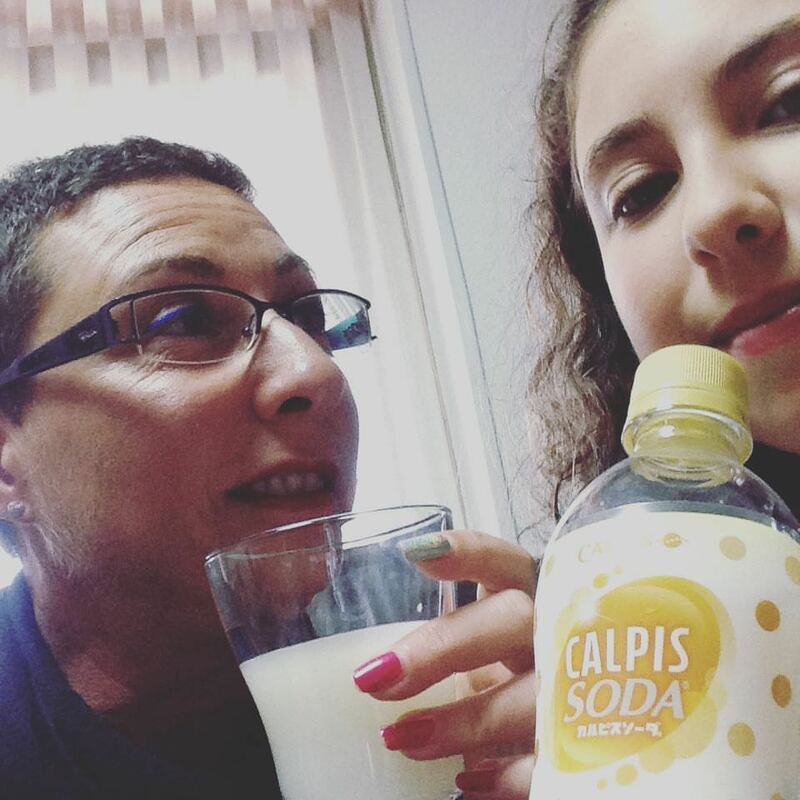 Calpis Soda, bebida refrescante que nos encantó!! Es una bebida de yogurt de acido láctico. 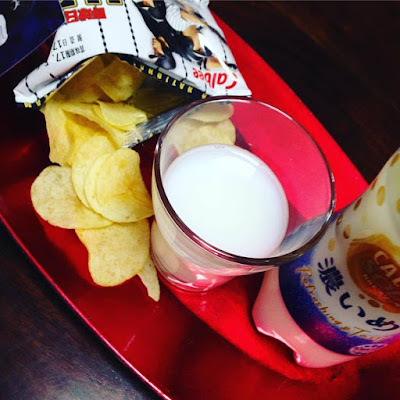 Calpis Soda, refreshing drink that we loved !! RICH TASTE CALPIS SODA. Commonly known as Calpico in other countries, Calpis is a lactic acid yougurt drink that is loved by all generations in Japan. This time, they've released a limited edition. 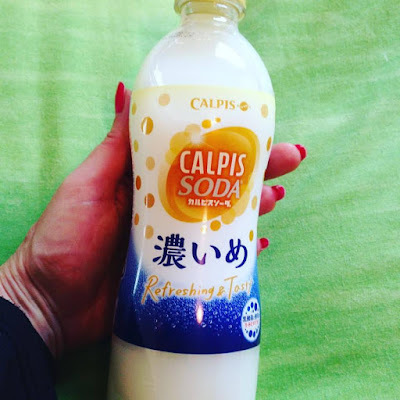 Rich Taste Calpis Soda which boasts being thicker and creamier than the regular kind. Nos la tomamos de aperitivo con unas chips Samurai que estaban buenísimas!! 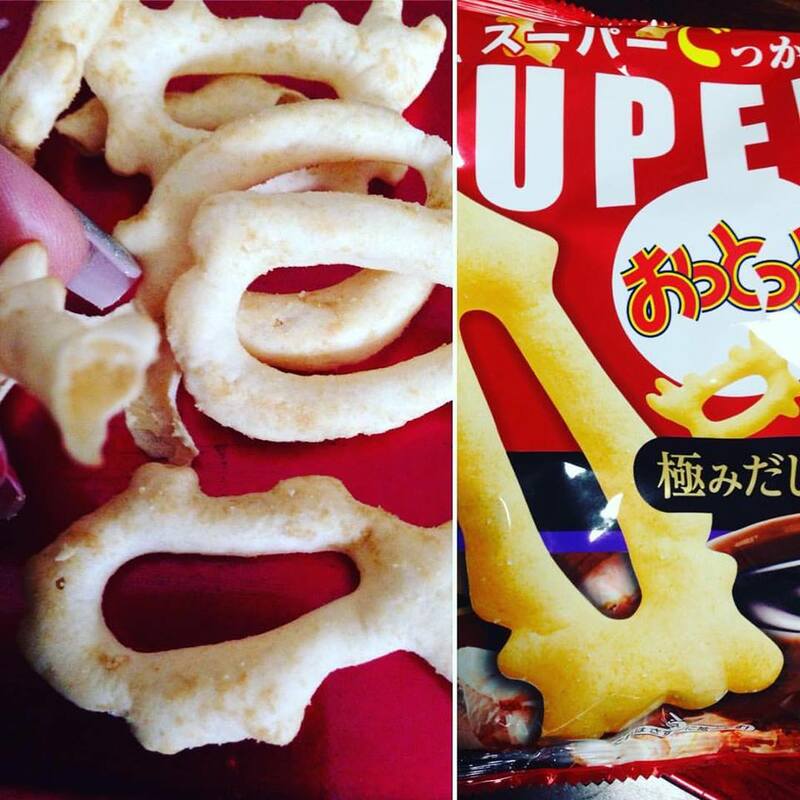 Las Samurai Japan Chips son unas patatas fritas que contienen cromos del equipo nacional de Japón en Baseball. We had the appetizer with some Samurai chips which were great !!. SAMURAI JAPAN CHIPS. Enjoy this mini-bag of lightly salted chips with the Japanese national baseball team design. 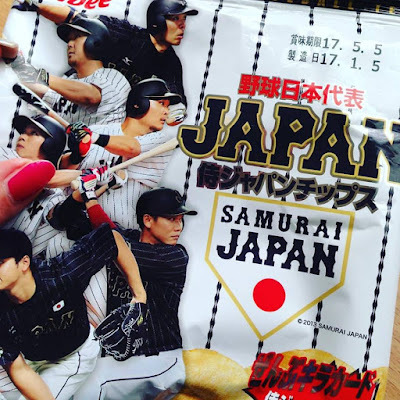 Each bag of chips contain a collectible Samurai Japan player card. 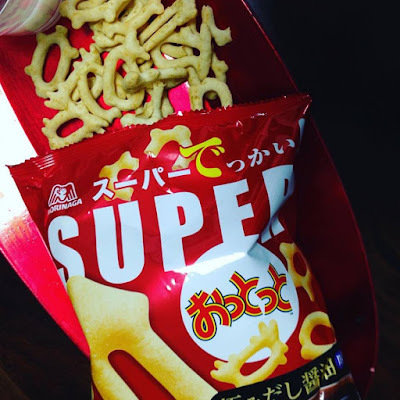 Estos snacks tienen como un toque picante peculiar, LA SOJA, a mi me gustaron, pero a las niñas no, ls formas son de criaturas del mar y si te pones a observar son super divertidas. These snacks have a peculiar spicy touch, I liked them, but the girls did not. SUPER OTTOTTO SAVORY SOY SAUCE FLAVOR. 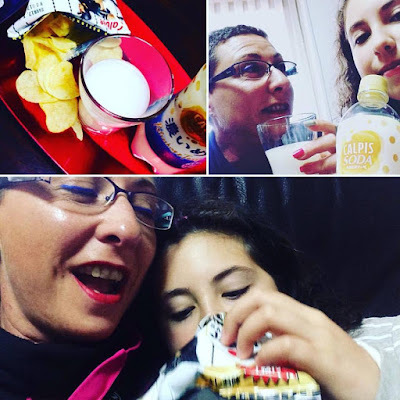 Generally enjoyed by kids, these potato snacks has been supersized so adults can enjoy them too! 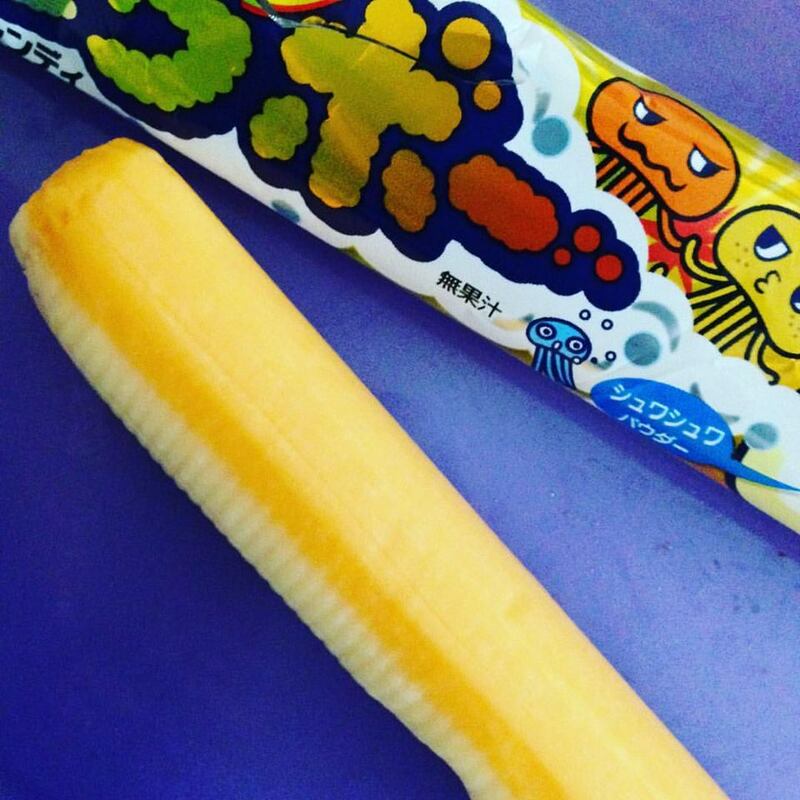 These cute snacks come in all different shapes of sea creatures. Enjoy the savory soy sauce flavor that is sure to have you coming back for seconds!. 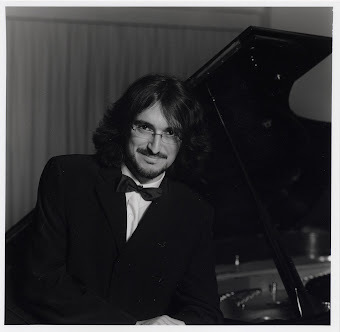 Caramelos. A Alejandra le gustaron mucho, si bien tienen poco sabor, ese sabor es CIRUELAS AMARGAS, ahí es ná. Candies. Alejandra liked them very much, although they have little flavor. 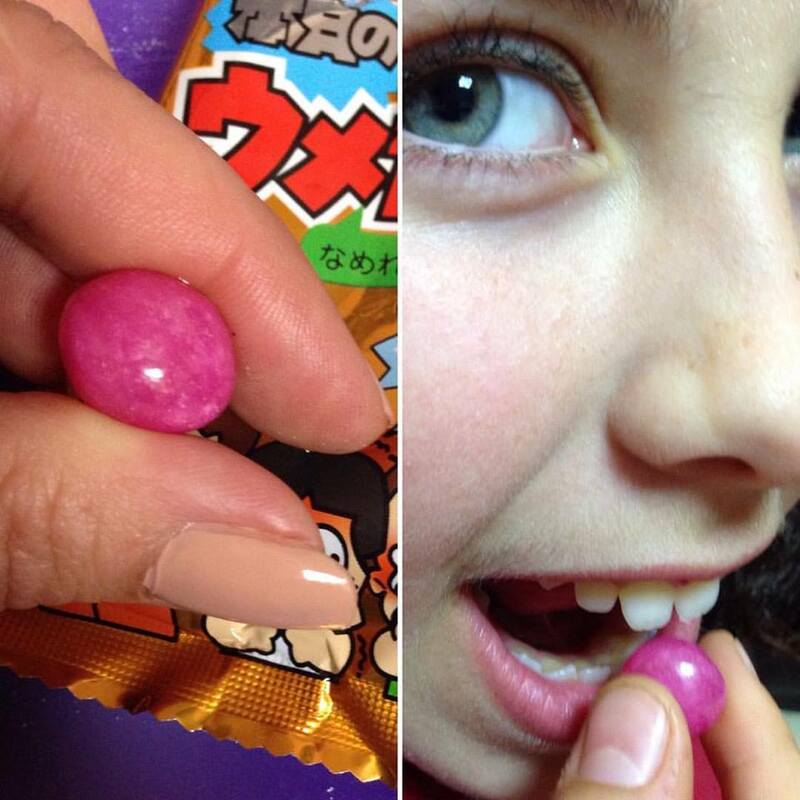 SOUR PLUM FORTUNE CANDY. This is like a candy Russian roulette! 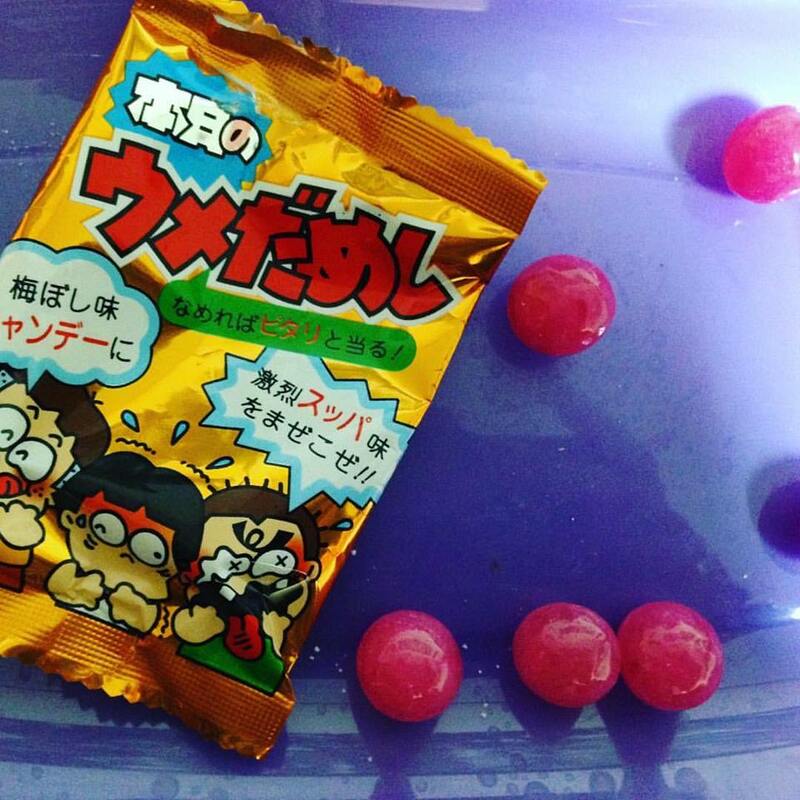 Each bag contains normal sour plum and super sour plum candies. Get one that's not too our and consider yourself lucky! 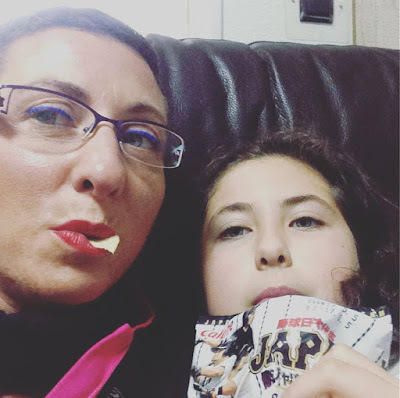 Esto es como nuestro palote pero en ácido, se lo comió Alejandra que le gustan las cosas así, yo como que no. A ver por un lado sabe a naranja y por el otro a limón y dentro es algo de soda cremoso que sabe como a cola, se van descubriendo sabores!!! FIZZY SOFT CANDY STICK. ORANGE & LEMON FLAVOR. One side of the this soft candy tastes like orange the other side tastes like lemon. The inside of the soft candy is filled with fizzy powder and once in your mouth the combination of the different flavors taste like cola! It's literally like a science experiment in your mouth! Gominolas para montar, curiosas. Este es el producto que vino con BONUS!! 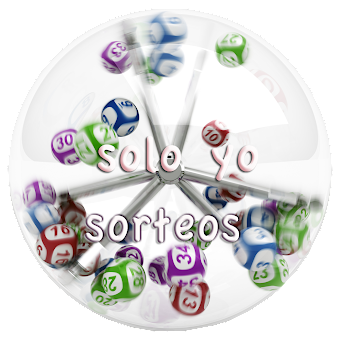 Es decir la caja pequeña traería 6 productos más este que es sorpresa!!! BONUS SNACK. 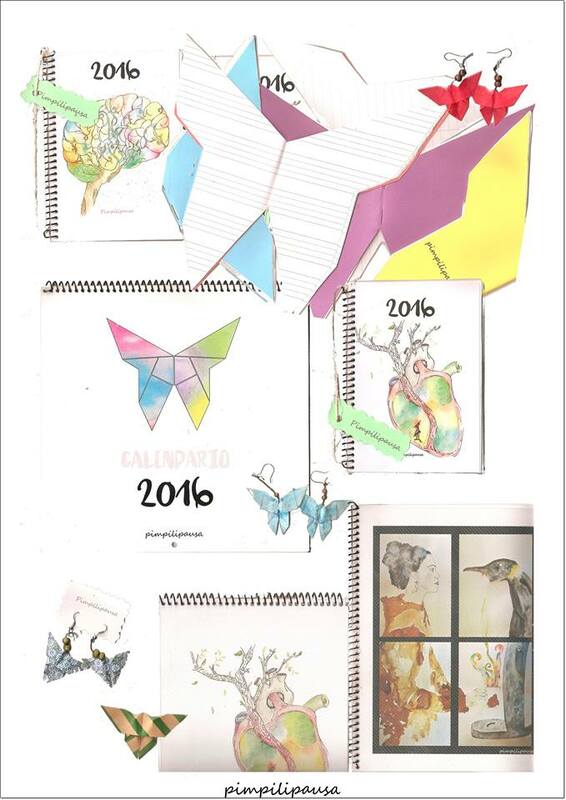 Like how adult give N.Y. money to kids in Japan, this month we've put in an extra treat in your box! We hope you enjoy the bonus snack. Este osito es como nuestro Kit Kat o nuestros Huesitos. Muy bueno. Es de vainilla y chocolate y dicen que light aunque eso no me lo creo. This teddy bear is like our Kit Kat or our Huesitos. Very good. SAKUPAN CHOCO MONAKA. How adorable is this snack? 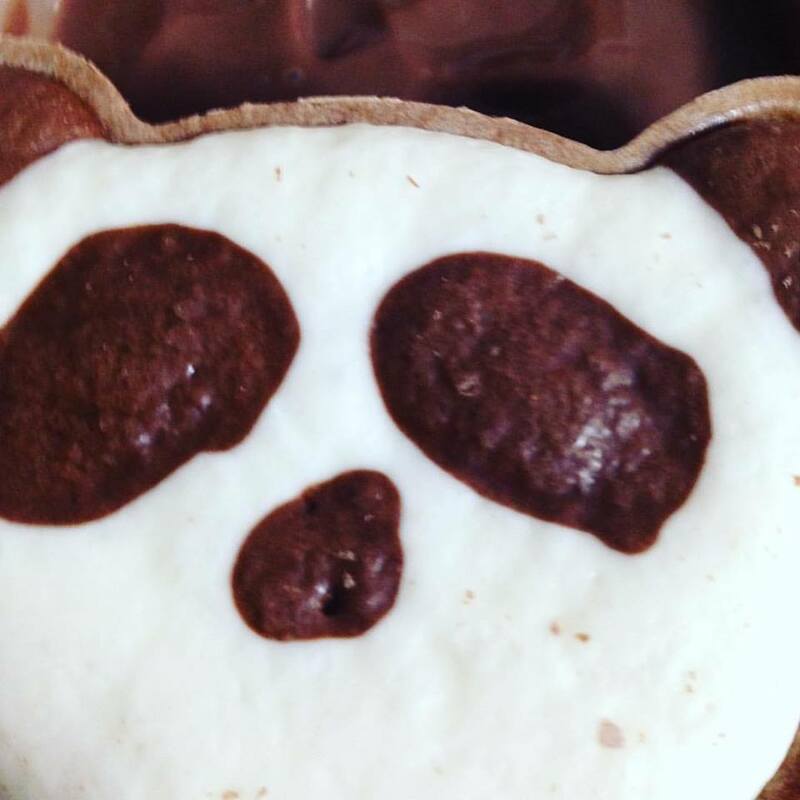 It's so cute, you might have second thoughts about eating it up! 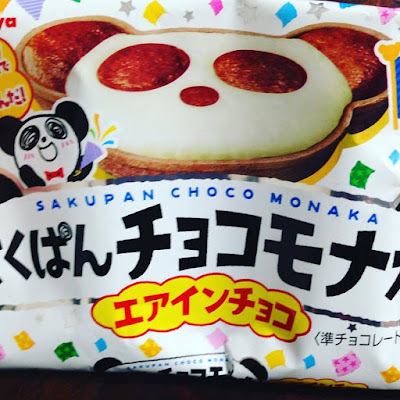 This panda shaped chocolate monaka is filled with a mix of super light vanilla cream and airy chocolate which compliments the light monaka perfectly! Palitos de mantequilla. Se los comió Julián que le encanta la mantequilla, dice que buenos, a mí no me van. GLICO GULTURED BUTTER PRETZ. 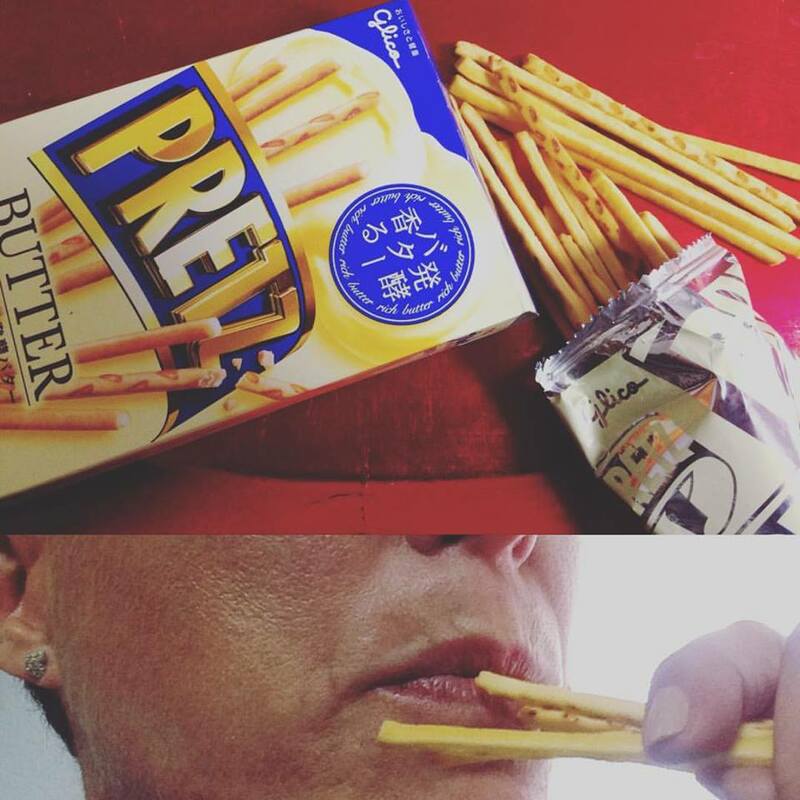 Pocky's savory counterpart Pretz released a new mouth watering flavor that we wanted you to try! This Pretz uses an abundance of cultured butter in the dough to create a crunchy biscuit snack with a delicious premium butter aroma and flavor. Chocolate con galleta, muy agradable, el sabor del chocolate es suave y lleva Frijoles Rojos, ahí es nada. Chocolate with biscuit, very nice, the taste of chocolate is smooth. ALFORT CHOCOLATE BISCUIT - RED BEAN FLAVOR. 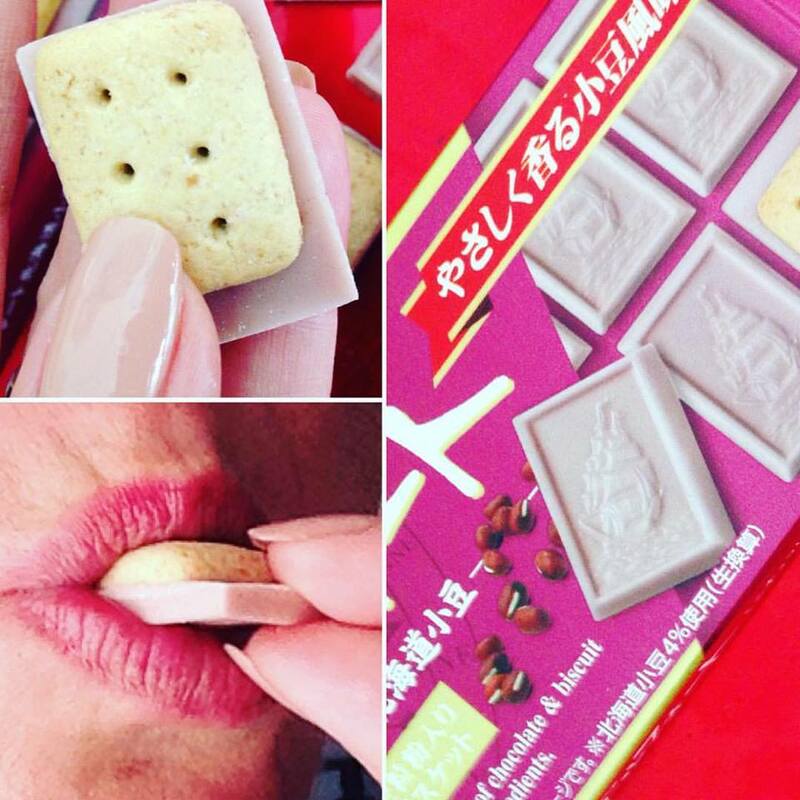 Alfort has added a new Red Bean flavor to their popular franchise of chocolate and digestive cookies that use red beans sourced from Hokkaido. Enjoy the unique combination of the delicate red beans flavor an buttery vanilla digestives with your favorite cup of tea for a full on east meets west snack. Gominolas... gustos raros, pero las niñas las devoraron. Son Uva y Manzana Verde, con 3 formas distintas. Gummies ... odd tastes, but the girls devoured them. FROG FAMILY GUMMY. 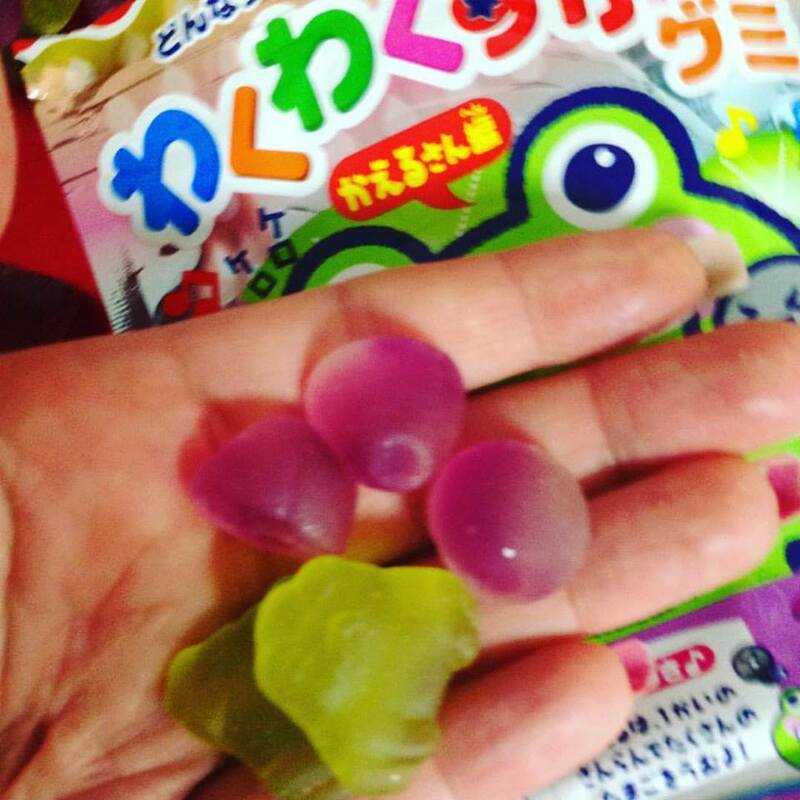 This Frog Family Gummy comes in 3 different shapes and 2 different flavors. The frog egg shaped gummy and tadpole shaped gummy come in grape flavor an the frog shaped gummy in green apple flavor. Gominolas de uva, lo dicho las devoraron, por cierto con distintas formas de Picachu, ya sea cabeza, mano o pie. 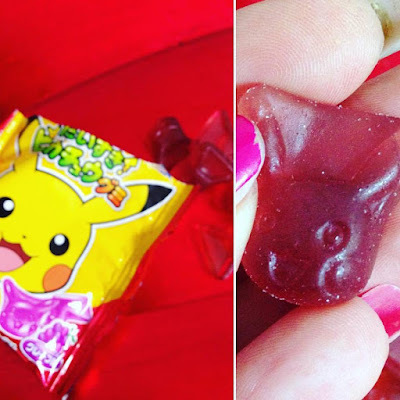 PIKACHU GUMMY. 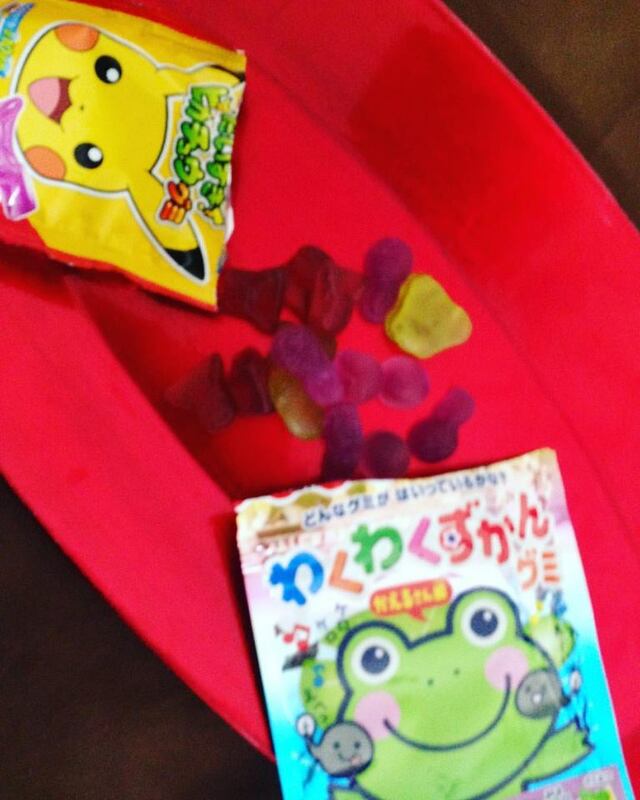 Enjoy juicy grape flavored gummies with this cute Pikachu snack. Each bag contains several different Picachy shaped gummies and also may include gummies in the shape of Picachu's tail and foot. Estos son unos caramelos con palo, lo que son los chupachus para nosotros, lo que pasa es que hay que hacerlos. Este producto correspondería al DIY de la Caja Medium. Viene con dos topping para decorar, y saldrán de dos texturas diferentes, te va explicando como hacerlo, es fácil y divertido. Ahora que se pueda comer ya es otra cosa! These are candies with stick, which are the chupachus for us, what happens is that they have to be made. DIY CANDY. NAKAYOSHI NERU NERU. MUSCAT GRAPE & STRAWBERRY FLAVOR. 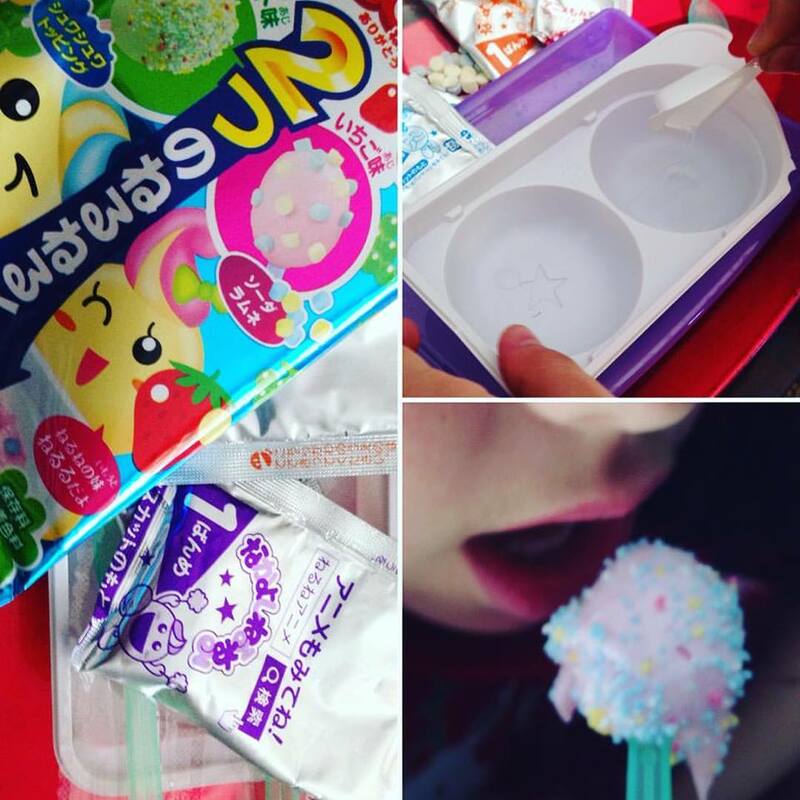 Did you know that Kracie's Nakayoshi Neru Neru DIY kit has been around for 30 years? This time we bring you the Muscat Grape an Strawberry flavored Neru Neru that allows you to add 2 different topping which have different textures and flavors to make them even more tasty! Se hace con un poquito de agua y se le echan dos sobrecitos de polvos a cada uno, y después la decoración. 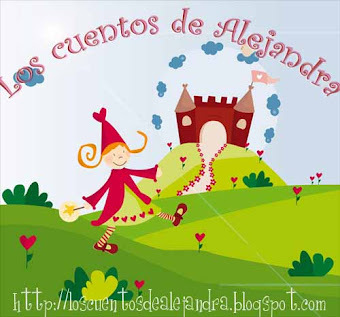 Muy pero muy dulces!!!! 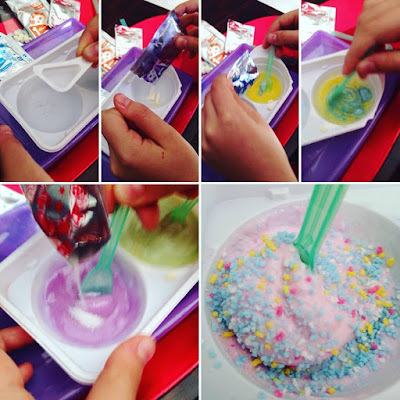 It is made with a little water and two sachets of powder are thrown to each, and then the decoration. Very very sweet !!!! 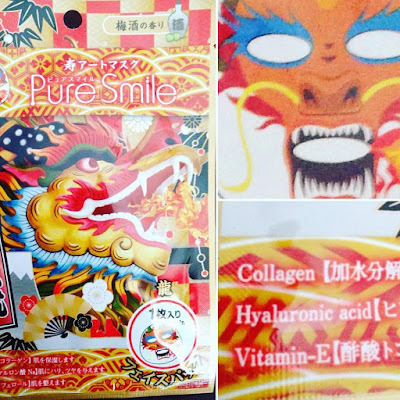 Mascarilla Facial Pure Smile, os la traeré en una nueva reseña en #ViernesDeSpa. Este producto es el especial de la Caja Premium. NEW YEAR'S FACIAL ART MASCK. Treat yourself to a post holiday TLC with 1 of 3 fun and festive facial masks we've included in your box. Get a rooste mask and count yoursef lucky because 2017 is the year of the rooster! Galleta de Barquillo con chocolate. Super Super buena !!!!! 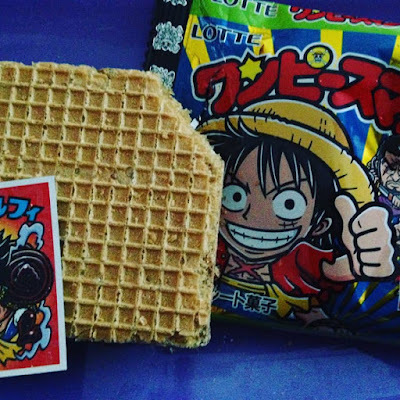 ONE PIECE CHOCOLATE WAFER. Always a popular choice, this One Piece snack has a tasty chocolate filling between two sheets of wafers to make for a simple but satisfying treat. 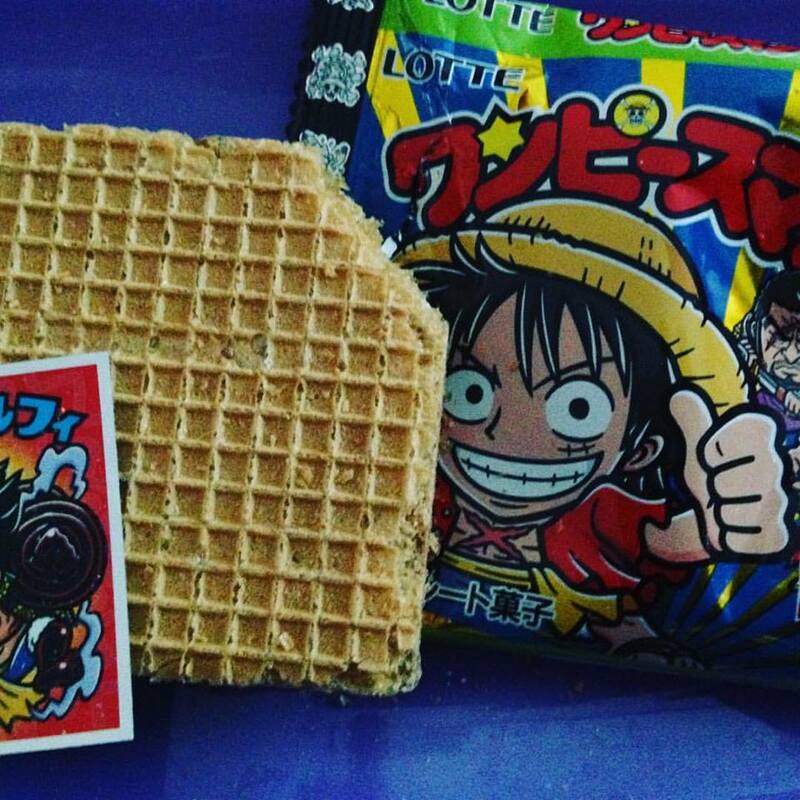 To add to the fun, an One Piece character stickers sin included in each snacks. Wafer biscuit with chocolate. Very good !!!! Son bollitos hechos con Anpan que es una masa japonesa que normalmente van rellenos con frijol rojo, en este caso están rellenos de leche condensada. A mí no me gustaron nada, pero mi hija los devoró. CONDENSED MILK CHOCO ANPAN. 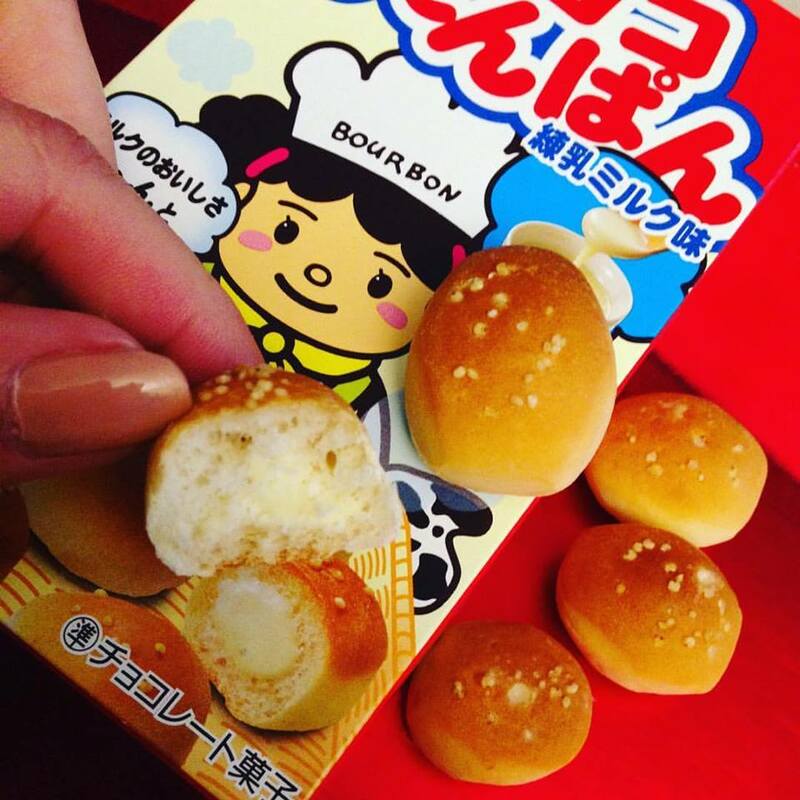 Anpan is a popular traditional japanese pastry usually with sweet red bean paste filling. Instead of red a bean paste, these bite - size anpans are filled with condensed milk to make for light but delicious treats. BLANCK THUNDER. Lleva trozos de galleta, chocolate y arroz, a mi me recordó al Crunch nuestro. BLACK THUNDER - KINAKO FLAVOR. KINAKO is a roasted soy flour which is used as a flavoring for many traditional sweets in Japan. 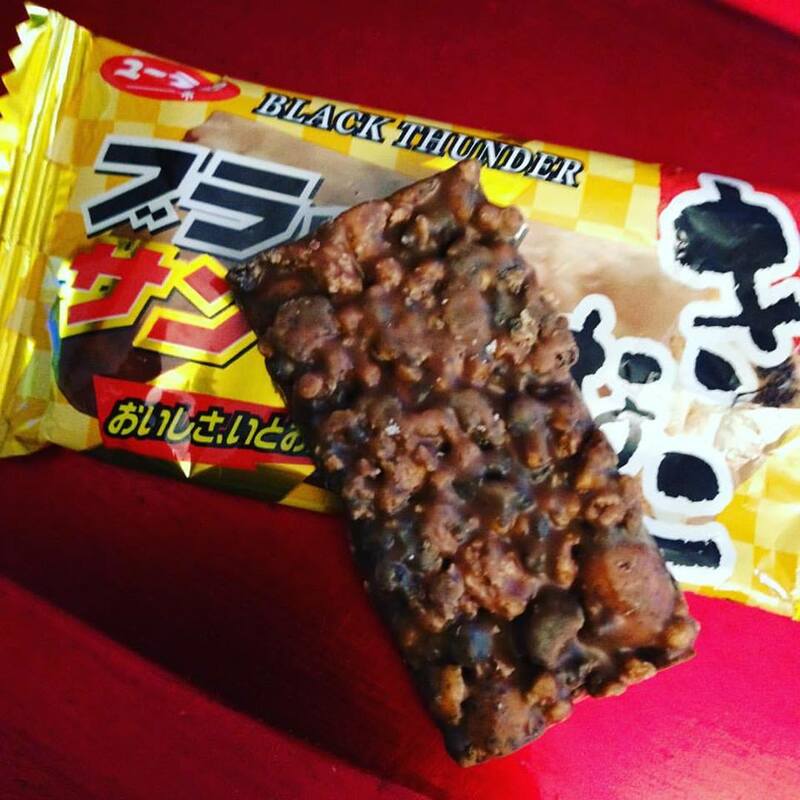 This time, we bring you a Kinako version of popular Black Thunder chocolate which also has chunks of chocolate cookie and rice puffs in them. Son palitos efervescentes de Soda y de naranja mixta, a mi me gusto el de Soda (amarillo) que me sabía a plátano y a Alejandra el de naranja. 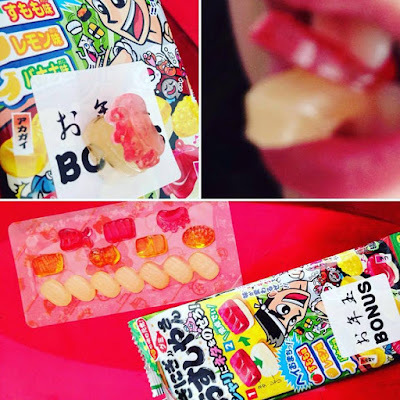 POKEMON STICK CANDY. These Pokemon stick candies come in 2 flavors - soda an mixed orange. Eat them individually or eat them together for a fizzy orange soda experience! 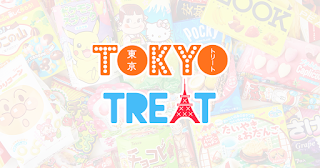 Si quieres suscribirte a la Japanese Candy de TokyoTreat, ya sabes, con un clic aquí arriba y listo. 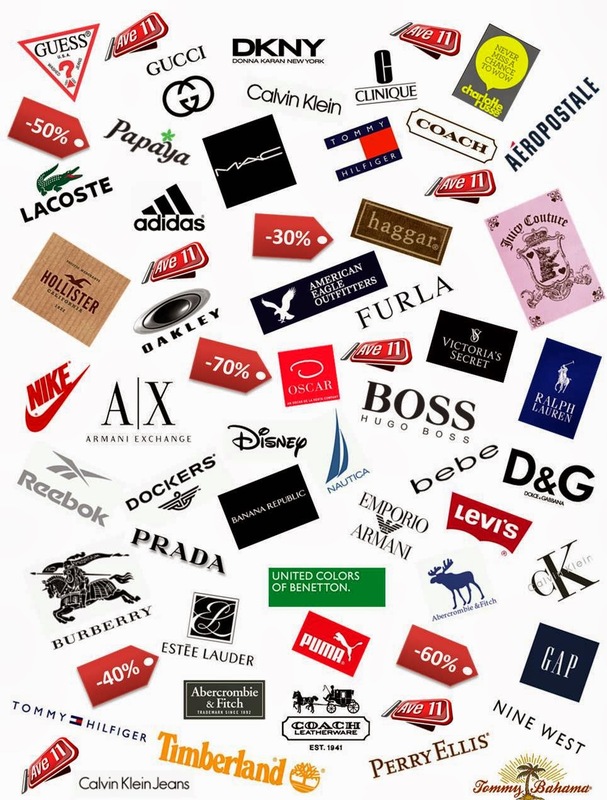 And so far my Premium box of the month of January, remember that the small box takes 5 to 7 products and leaves for 14.99 €, the regular box would be composed of 8 to 12 products, with a DYI (special product) and would cost € 24.99 and the PREMIUM box has 13 to 17 products and costs € 34.99 If you want to subscribe to TokyoTreat Japanese Candy, you know, click here and that's it. ¿Y los ingredientes vienen en español? 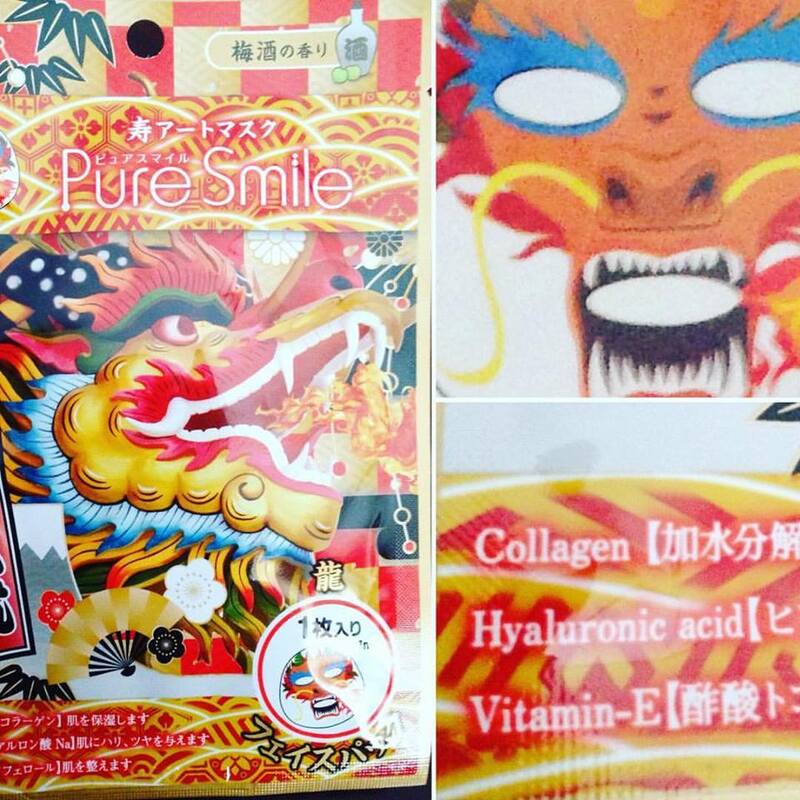 En las bolsas viene todo en japonés, en la revistita que te mandan, ya te lo pone en inglés, y ahí te enteras.